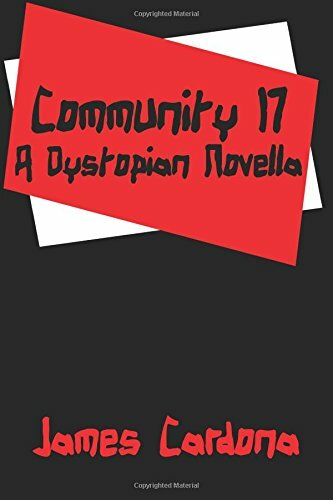 “Community 17” by James Cardona is an intense novel that takes readers deep into the degradation and control of a dystopian society. Isaias, a teenager and a pleb, dreams of escaping the slums of his community. In his dreams, he marries Jessia and lives in a small home in the city, surrounded by their children. To achieve these dreams Isaias must do well in his studies and pass the programming exams given by the Agency. Only after passing these exams will he be granted citizenship of the city. Failure to pass the exams will resign him to the hopeless life of a pleb, full of disgrace, humiliation, poverty, and struggle, without Jessia. Isaias’ dreams are disrupted one day when one of his friends, Edra, blows herself up just outside the checkpoint gates of the city. Isaias finds it hard to believe that Edra would involve herself willingly in the fight of the free thinkers, a group whose mission is to overturn the Agency, and stop the inhumane treatment of plebs. Everyone associated with Edra will be questioned by the Agency men in the hunt for the free thinkers, and many of those interrogated will never return. Isaias soon finds himself as a pawn, caught between the free thinkers and Agency insiders. Nothing is as it seems. Isaias’ only desire now is survival, as his long sought after dreams seem to be mere hallucinations of the boy he used to be. This book caused my spine to tingle with the very first sentence and the intensity of the storyline kept it tingling through to the very last page! The author has a natural story-telling gift and I thoroughly enjoyed his engaging writing style. Some of the characters will enrage you, while others will tug at your heartstrings; all of them will evoke emotions that will leave imprints in your mind long after you put down the book. I highly recommend “Community 17” by James Cardona. While the story will appeal to a wide audience, it may be appreciated most by young adults. It is full of action-packed drama, heightened suspense, and young romance, all in the middle of trying to save the world from a dystopian society. Great read!